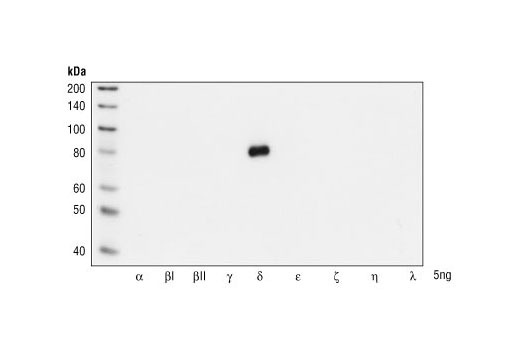 Western blot analysis of Baculovirus expressed PKC isoforms, demonstrating the isoform-specificity of PKCδ Antibody. 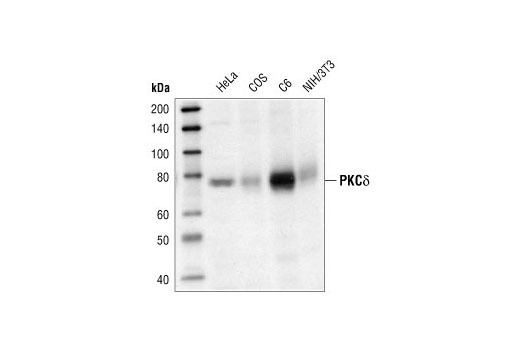 Western blot analysis of extracts of HeLa, COS, C6 and NIH/3T3 cells, using PKCδ Antibody. PKCδ Antibody detects endogenous levels of total PKCδ protein. The antibody does not cross-react with endogenous levels of other PKC isoforms. Polyclonal antibodies are produced by immunizing animals with a synthetic peptide corresponding to human PKCδ. Antibodies are purified by protein A and peptide affinity chromatography. Phosphorylatioin of tyrosine residues in PKCdelta are suggested to play a role in determining its functional properties. Phosphorylated tyrosine residues have been identified in the catalytic domain, regulatory domain, and the hinge of PKCdelta (8). While no clear designation of regulatory specificity has been deciphered based on phosphorylated tyrosine patterns, these various phosphorylations have been shown to decrease PKCdelta protein level, increase kinase activity or increase selectivity of substrate specificity (8-10). Konishi, H. et al. (2001) Proc Natl Acad Sci U S A 98, 6587-92. Steinberg, S.F. (2004) Biochem J 384, 449-59. Blake, R.A. et al. (1999) Cell Growth Differ 10, 231-41.